The Boyertown Museum of Historic Vehicles in Pennsylvania includes gasoline, steam and electric powered cars along with carriages and sleighs. The main exhibit area is in the former factory of the Boyertown Auto Body Works, where truck bodies were built from 1926 through 1990. A few of these trucks have returned home and are now on display. Located 50 miles northwest of Philadelphia, the museum’s focus is on Pennsylvania-built cars, reflecting the Keystone State’s importance in the early automobile industry. There’s also a connection with automotive pioneer Charles Duryea, who built vehicles in the area. A showpiece of the museum is the 1872 Hill (shown above), one of the earliest autos in existence. Teenager James Hill built it just up the road in Fleetwood. Ironically, given the name of the inventor, the first model was too weak to climb hills. The 1913 S.G.V. Touring Car was built in nearby Reading and originally featured a steering wheel mounted pushbutton Vulcan Electric Gear Shift. Unfortunately the wildly named technology was ahead of its time and malfunctioned repeatedly, causing the cars to be retrofitted with a floor mounted shift. A 1915 Biddle with dual side-mounted wire wheels was manufactured in Philadelphia, one of only five believed to exist, while the rakish cream-colored 1918 Biddle Roadster (above) looks like it could race on the streets right now. Six Duryeas manufactured in southeastern Pennsylvania are on display including a Philadelphia-built 1917 Duryea GEM Roadster, a three-wheeled hybrid of motorcycle and car. It was a sales flop and Charles Duryea’s last attempt at automobile production. At least the GEM came with a steering wheel, unlike the joystick steering on the other Duryeas. The stubborn car builder didn’t like steering wheels and was late to the game in using them. The extensive bicycle collection highlights the way many car companies grew out of bicycle manufacturers; in an intriguing setup there are two bicycles from the Acme Bicycle Manufacturing Company alongside a 1910 Acme Roadster. The 1952 Masano is a unique car built by Reading, PA auto dealer Tom Masano. Its one-off fiberglass body is mated with a Henry J chassis Masano found in a junkyard—what’s most striking is the triple tail fin configuration straddling the trunk. 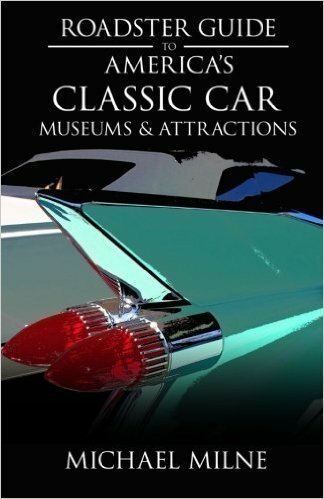 It was the first fiberglass bodied car to be licensed in Pennsylvania. The oldest attraction is the restored 1872 Jeremiah Sweinhart Carriage Factory; it was the launching pad for the Boyertown vehicle industry. Inside you’ll find a reconstructed blacksmith shop and belt-driven machine shop which still works. Several carriages are on display including one of the museum’s oldest pieces, an 1875 Hose Cart that was used by the local fire company which, not looking bad for its age, now resides in the shop where it was built. The museum also features roadside architecture including a 1921 Sun Oil cottage-style service station and the 1938 Fegely’s Reading Diner. During periodic Diner Days, visitors can sit down in the diner and order a cup of coffee and slice of pie at 1930s prices. A must-see event is the annual Duryea Day Antique, Classic Car and Truck Show that takes place Labor Day weekend and attracted over 700 entrants last year. Find the Boyertown Museum of Historic Vehicles online at www.BoyertownMuseum.org. Check the website for special blacksmithing days and carriage factory tours. For a cool side trip, visit nearby Fleetwood to see where early versions of this iconic model were built. Here’s our 2017 gift guide for travelers.